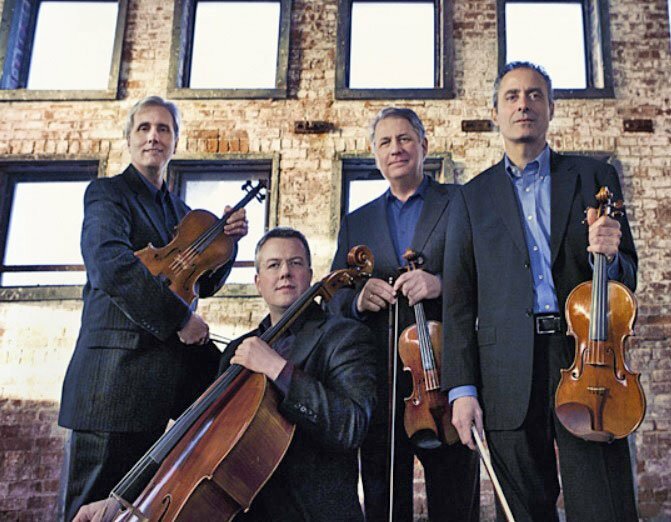 The Cape Cod Chamber Music Festival opened last Wednesday with the Emerson Quartet playing late Beethoven, Op. 131 and 130, the latter with its original Grosse Fuge finale, in Wellfleet’s effective concert hall, the First Congregational Church. No need to describe these works: one can hardly say enough about them, and I for one can never hear them often enough. Starting in my early teens, when my parents took me to hear the Budapest play all of the Beethoven quartets annually at New York’s Metropolitan Museum, I’ve heard many of the most famed foursomes take them on. But for some reason, this was the first time I heard the Emerson, founded 1976, play late Beethoven. As is the Emerson’s wont, the two fiddlers trade places, with Philip Setzer leading Op. 131 and Eugene Drucker playing first in Op. 130. I have to report a decidedly mixed evening, as I found myself disappointed in the performance of 131 but thrilled with 130. Why? For starters, two of the veterans, Setzer and violist Lawrence Dutton sounded a bit subdued, at least in comparison with past performances. Drucker seemed more animated, leaning in when the music calls for prominence in his voice, sitting back when Beethoven asks him to. In striking contrast, Paul Watkins, the burly Welsh cellist who’s still a relative newcomer after joining the eminent ensemble five years ago, used his expressive eyes and commanding body to urge his senior colleagues on. But was this all perhaps occasioned by change in posture rather than mood? Until recently, the Emerson players stood, except for the cellist seated on a riser. This time everyone sat at lower altitude. Did it make a difference? Op. 131 seemed to go along quickly. While the seven movements are written to move seamlessly from one to another, there needs to be room for the audience to breathe, to register what has ended and what is beginning. I didn’t sense that. Moreover, sheer speed, albeit admirably virtuosic, led the Presto to blur rather than sparkle, and the jagged, frightening final movement flew by, contours smoothed off. The hurry surprised me. If they had been younger, I wouldn’t have been puzzled, but as players age, they tend to play music more slowly. (Glenn Gould’s two adventures with the Goldberg Variations furnish perhaps the most striking example, but there are many others, and in conversations I’ve had with illustrious older stars they often express regret over the rapid speeds they chose in some of their earlier recordings and performances.) Perhaps as a result, intonation suffered at times also, and there seemed overall indecision about the shape of the music, tension between a Classical rendering and one with a more Romantic foundation. Example: Setzer chose to slide from B sharp into C sharp, the second and third notes of his solo introduction to Op 131. This seemed to echo the Romantic school. But in contrast to leisurely tempi, he chose also to lead some sections with blinding speed. Somehow or other the whole failed to compute, as vernacular has it. Op. 130 went wonderfully. Suddenly, with far more color, more variation from pianissimo to different levels of forté, rhythmic subtlety, suspense, along with fun, we could breathe. Drucker’s virtuosic riffs sparkled, and the cavatina has never been more moving. The basically incomprehensible fugue changed moods frequently, helping the listener parse some of the structure. And it ended not with a shriek but with chords that seemed settled and brilliantly measured. Why two such different experiences? Some explanation may come from two different leaders and types of instruments. As I’ve noted before, Drucker and Watkins play old instruments, an early 17th-century Stradivarius violin reflecting the influence of Amati in Cremona and a mighty Venetian cello from the following century. Setzer and Dutton play modern instruments created in the Big Apple by Samuel Zygmuntowicz, one of today’s preeminent luthiers. To my ears, the early instruments, not louder, lend themselves to a broader range of colors. Drucker’s notes high up sparkle and cut through whatever’s going on, while his G string, not so deep and throaty as later Strads, projects with focus and beguiling woody quality. The modern instruments seem less able to vary; they have beautiful voices, but they rarely change. To use string player language: they aren’t as malleable. But is it the player or the instrument? Could we control for more variables? What would happen if these masterful players switched instruments, not only parts? And what of my ears and my biases. Here I felt a bit reassured by several in the audience with whom I conducted admittedly primitive qualitative research during intermission and after the proceedings. Among the seasoned listeners—some players, some scientists, and some “mere” enthusiasts—I asked open-ended questions, trying not to convey my own impressions. Strikingly, almost to a one, they described the instruments much as I experienced them. And overall, Op. 130 came out a big winner. Most important, of course, Beethoven and the Emerson Quartet furnished the audience much needed food for the soul at a time of unrest everywhere. Everyone responded with gratitude for this fine start to the season. Tom Delbanco is the John F. Keane & Family Professor of Medicine at Harvard Medical School and Beth Israel Deaconess Hospital. An avid violinist since age nine, he has particular interest in the evolution of stringed instruments from the 16th century on.